The Union Minister for Agriculture and Farmers Welfare, Shri Radha Mohan Singh and the Union Minister for Petroleum & Natural Gas and Skill Development & Entrepreneurship, Shri Dharmendra Pradhan witnessing the signing of an MoU, in New Delhi on March 20, 2018. The Minister of State for Agriculture & Farmers Welfare and Panchayati Raj, Shri Parshottam Rupala, the Ministers of State for Agriculture and Farmers Welfare, Smt. Krishna Raj and Shri Gajendra Singh Shekhawat, the Minister of State for Skill Development & Entrepreneurship, Shri Anantkumar Hegde and other dignitaries are also seen. 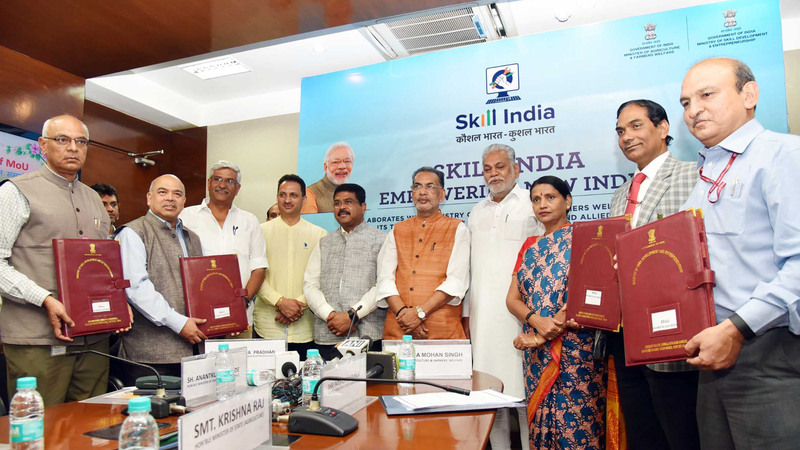 New Delhi: The Ministry of Agriculture and Farmers’ Welfare and the Ministry of Skill Development and Entrepreneurship today signed an MoU to conduct skill development training programmes for agriculture and allied sector, on a regular basis, at Krishi Vigyan Kendra (KVKs). Meanwhile, the skill development training programmes currently being run across KVKs will continue. The Minister of Agriculture and Farmers’ Welfare Shri Radha Mohan Singh expressed happiness over the signing of MoU, which he said, will help increase cooperation. Also present on the occasion were Ministers of State for Agriculture and Farmers’ Welfare Shri Parshottam Rupala, Shri Gajendra Singh Shekhawat and Smt. Krishna Raj along with Shri Dharmendra Pradhan, the Minister of Petroleum and Natural Gas and Skill Development and Entrepreneurship and Shri Anant Kumar Hegde, Minister of State for Skill Development and Entrepreneurship. Strengthen and develop other aspects of farmers’ income such as horticulture, animal husbandry, beekeeping, dairying, fisheries etc. In view of the latest developments in agriculture, several new dimensions in agri-warehousing, cold chain, supply chain, dairy, poultry, meat, fishery, horticulture, agricultural mechanization, micro-irrigation, hydroponic greenhouses etc have emerged for skilled and trained youths to gain self-employment. In 2016-17, 203 skill development programmes comprising 200 hours were organized by 100 KVKs and 8 national training institutes, training 3549 youths. For this, Rs 3.53 crore was spent from Rashtriya Krishi Vikas Yojana (RKVY). In 2017-18, 94 training institutes have organized 116 skill development training programmes and imparted training to 2320 youths. A provision of Rs 2 crore has been made for conducting skill training programmes in 2017-18 which is proposed to be increased to Rs 17 crore in 2018-19. The Minister said due to the low presence of agro-based industries in rural areas, it is important to increase the ratio of self-employment to employment to 100%. He said there is a need to study the Skill Gap Analysis in agriculture sector by the Agriculture Skill Council of India (ASCI).